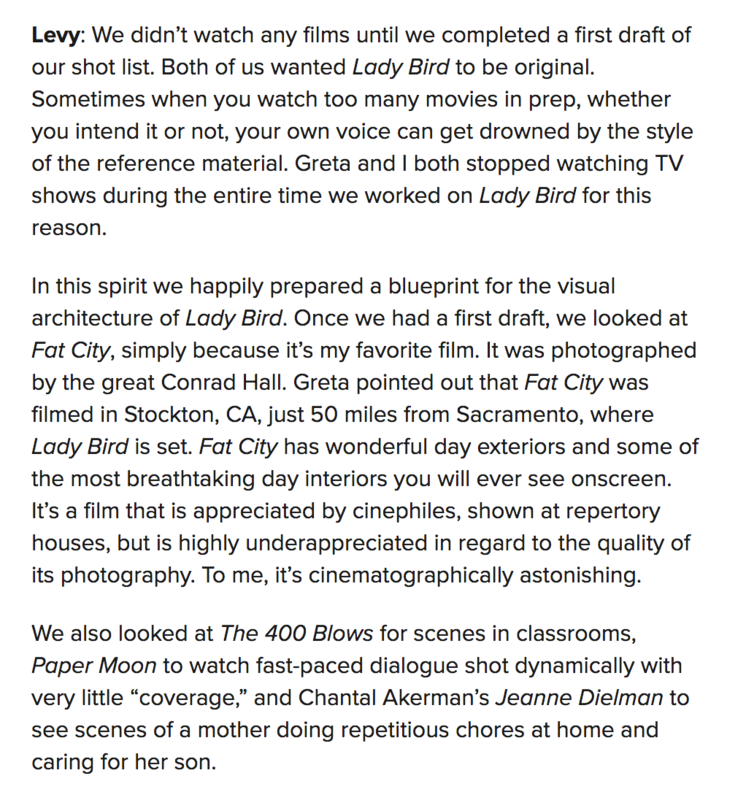 Check out my interview with Lady Bird director of photography Sam Levy for Filmmaker Magazine. Check out my Filmmaker Magazine interview with Rachel Morrison regarding her work on Netflix’s Mudbound. Set in post-World War II rural Mississippi, Mudbound was shot on Alexa Minis using Panavision PVintage spherical lenses and Panavision B, C, and D series anamorphic glass. 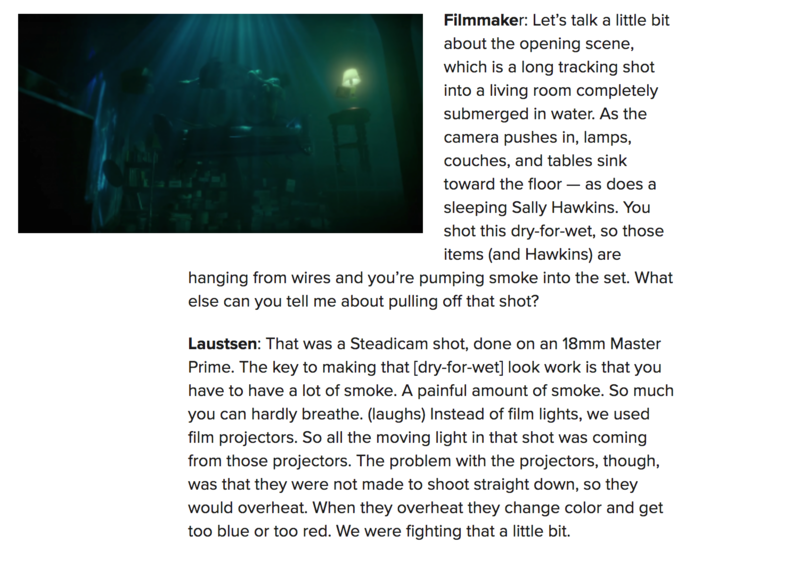 Check out my interview with The Shape of Water cinematographer Dan Laustsen (Nightwatch, Crimson Peak, John Wick: Chapter 2, The Brotherhood of the Wolf) for Filmmaker Magazine. Laustsen’s third collaboration with director Guillermo del Toro, The Shape of Water tells the story of a mute cleaning woman (Sally Hawkins) who falls in love with the amphibious creature (Doug Jones) housed at the government research lab where she works. Shot on Arri Alexa XTs with Master Prime lenses on a surprisingly skimpy budget of $19.5 million. Check out this interview I did for Filmmaker Magazine with Emmy-nominated Gotham cinematographer Crescenzo Notarile ahead of tonight’s Season 3 premiere on Fox. Notarile talks about Gotham’s signature style, the challenges of hiding lights from the show’s wide-angle lenses, and what he learned from working on Sergio Leone’s Once Upon a Time in America. 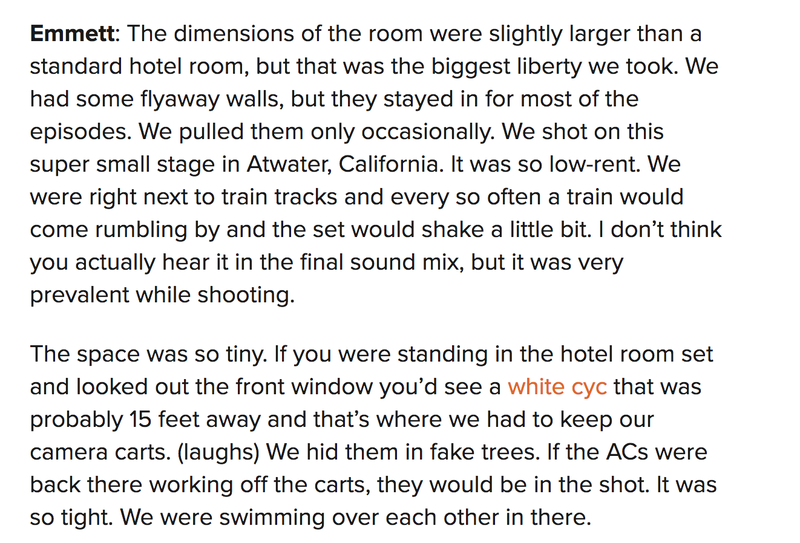 Here’s Notarile on Once Upon a Time in America cinematographer Tonino Delli Colli. Back in February a trolling movie critic questioned whether comedian Amy Schumer could possibly stir the loins of male moviegoers enough to be believable as the romantic interest of a chiseled, hunky lothario like Bill Hader in the upcoming romcom Trainwreck. Schumer responded as any talented comedian would – with pointed mockery. Unleashing an episode-length sketch on Comedy Central’s Inside Amy Schumer, the show’s namesake transformed the 1957 drama 12 Angry Men into a satire of male chauvinism as a jury room full of legendary character actors- your Giamattis’, your Goldblums’, your Hawkes’s – debate whether Schumer is hot enough to be on TV. From the moment she began hijacking the family camera as a grade schooler, there was little doubt Rachel Morrison would live her life peering at the world through a viewfinder. The only question was whether Morrison would be adjusting the aperture on a still camera or movie camera. I’m working on finishing up an interview with Zombeavers (2014) cinematographer Jonathan Hall for later this week. Here’s a little preview – a behind the scenes set-up showing how Hall pulled off an effect in which an animatronic beaver bursts through the planks of a wooden raft. The film employed a pair of Arri Alexas – one of which floats above in this shot on a J.L. Fisher 23 crane. Behind the actors you’ll find a 12×12 frame of highlight serving as diffusion.